I'm not sure that's in the 30th St Studio; it and its few companions from the era don't show enough beyond the console for me to identify location. If anyone else can tell, please comment. I'm guessing the red X means it was used for something. It doesn't match the console in the Gould footage from 1981 (see 6:17 in the video above). Similar, but there are some differences, notably the meter bridge and the panel on the right. It looks more like the console from studio E seen at the end of the Company film, but 1) you can't see the meter bridge in that shot, and 2) the area to the right of the console seems to be different. Whether that's another studio (B? ), or the console and control room in C (or E!) were changed at some point is unclear. Now we get into some meat, but before we start I want to rectify an earlier omission. Most of the pictures of the 30th St. 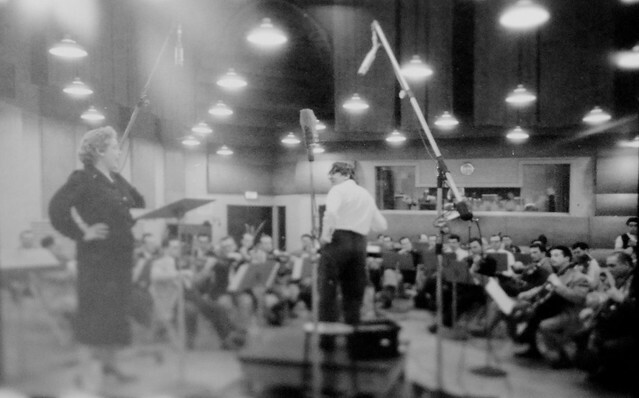 Studio that we enjoy were taken by CBS Staff Photographer Don Hunstein, whose photographs were just as exquisite as the music that is enjoyed on a daily basis around the world. 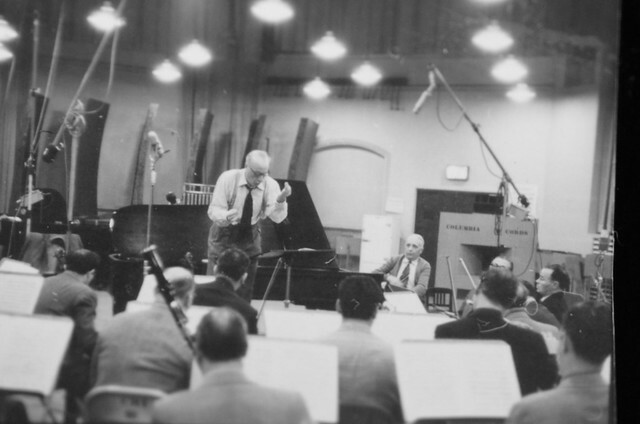 If you looked at the Frank Laico video in the OP, you heard him tell the story that when CBS bought the building in 1949, Mitch declared to CBS brass that they could buy it to be used as a recording studio on one condition: that it stay as is. It was not to be cleaned, washed, painted, fixed up, or changed in any way. It sounded fantastic as is, and had to stay exactly as it was to preserve that sound. That story is repeated in several if not many books and articles, and in my limited examination of them they all cite Frank as the source. You have also heard in the video that when I asked Frank a particularly detailed and geeky question about something, he replies something like, "Look, I'm an old man now (he was 89 and a couple days away from 90 in that video) and what you are asking me took place 50 years ago!" There are other places (Wikipedia for one) that talks about CBS taking over an abandoned Armenian church. That may have come from Frank as well, and we've already seen that it wasn't quite abandoned or Armenian for long. As much as I loved Frank and appreciated the details that he shared with us, he was human and human memory fades over time. This is why I like pictures; they don't change and provide a record of what actually was rather than how we remember it. 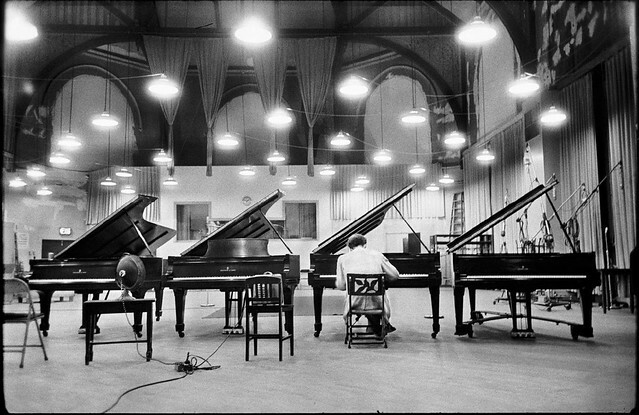 This is Glenn Gould in front of the old control room; it may have been in Life magazine and therefore not a Don Hunstein pic, I don't know. Notice the stark walls. No frills, no padding. 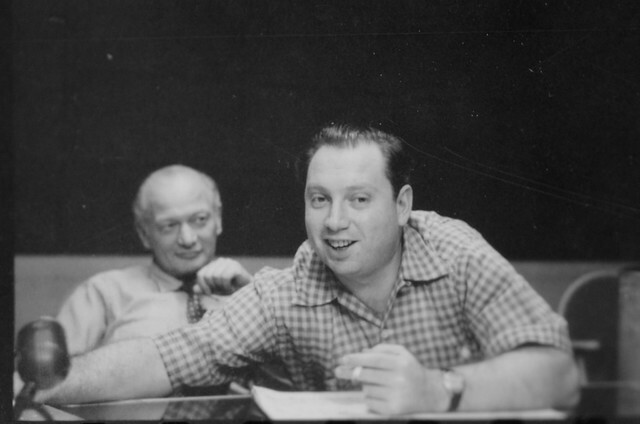 That is Howard Scott on the left in the control room, Fred Plaut in the middle, and probably Bob Waller on the right. There are drapes in various places, but every surface isn't covered, and some of the drapes have been purposely gathered to be smaller. 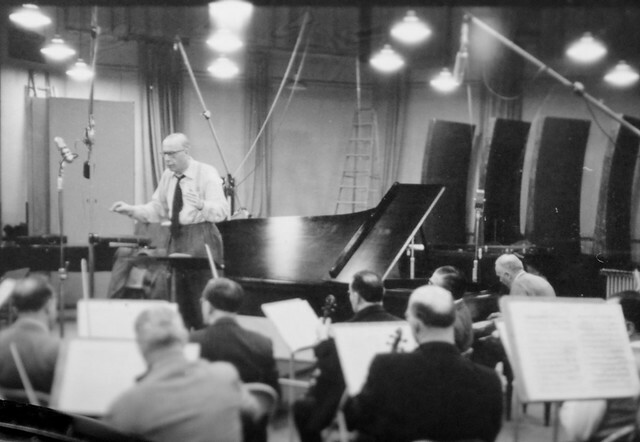 This picture is showing how Glenn had multiple Steinways brought in so he could pick the one he liked the best, and there is a heat dish pointing at him and a space heater next to him. 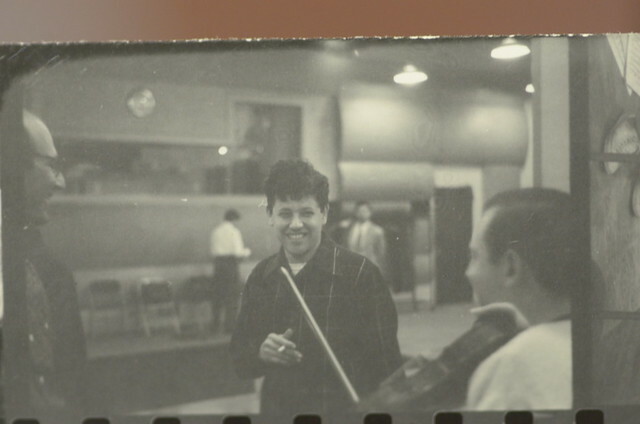 I am not sure, but think that this is the same July 1959 recording session in the earlier video rather than his initial 1955 one. I'll tell you why in a future post, and if we move on to the next era and I have forgoten to do so, please ask. 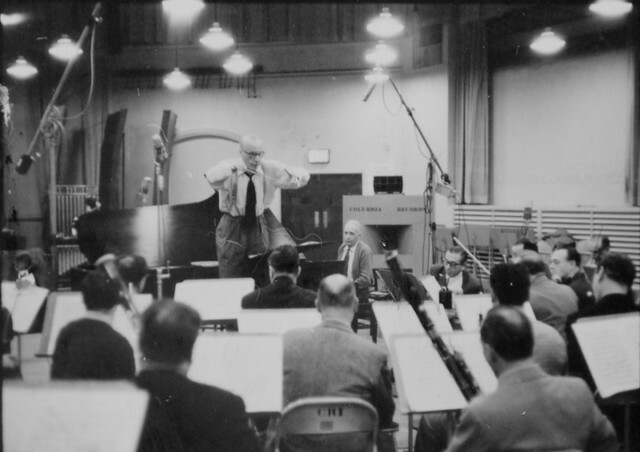 Here's another sweet pic, from Al Q's Flickr, showing Aaron Copland and a large orchestra, which he says is from 1960 and so will help us date the transition to the new control room. 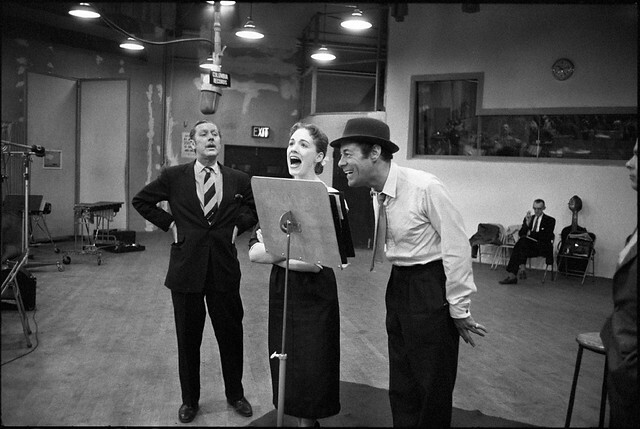 L-R are Robert Coote, Julie Andrews, and Rex Harrison. This one really clearly shows all the patched walls and blotchy paint that seems to prove that Mitch's admonition to leave it alone and don't fix it up any more than you have to, and is the picture I've used in talks to illustrate that. But now we get into pictures from MSS 52, The Frederick and Rose Plaut Papers in the Irving S. Gilmore Music Library of Yale University, and see that things aren't quite what they seemed. And a reminder that these pictures are pictures of individual contact sheet pictures that were not super well made in the first place, and have been scuffed around a little since. Not to mention that I was taking pictures as fast as I could to get through a lot of material in the one short opportunity that we had to be there. That's Howard Scott on the left, don't know who it is in the middle or right. What are those curved things on the wall next to the control room? Johnny Todd, Fastnbulbous, chilinvilin and 7 others like this. 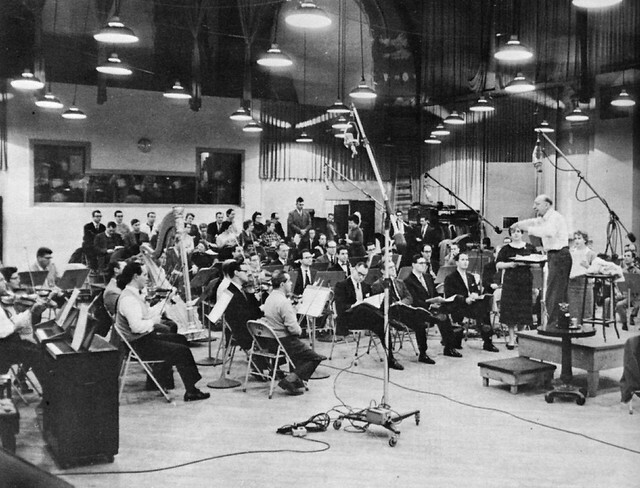 Here is a different session and another part of the studio. If you know what the session was, or who any of the people pictured are, please let me know. There are more horizontal curved things on the wall on the left, and the vertical ones on the right also protrude from the wall. If I didn't already know that there was no acoustic treatment in the 30th St. 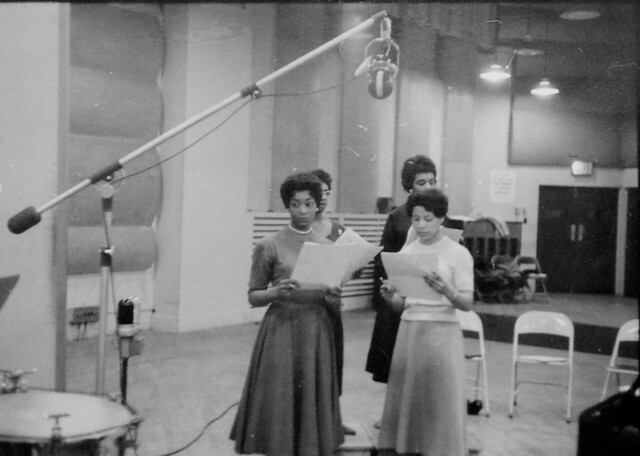 Studio, I would say that those are acoustical baffles, and probably diffusors. That is the operatic soprano Eleanor Steber, with Jean Paul Morel conducting. Johnny Todd and chilinvilin like this. That was me; mea culpa. chilinvilin, marmil and bluemooze like this. This is a fantastic thread, thanks for the effort. 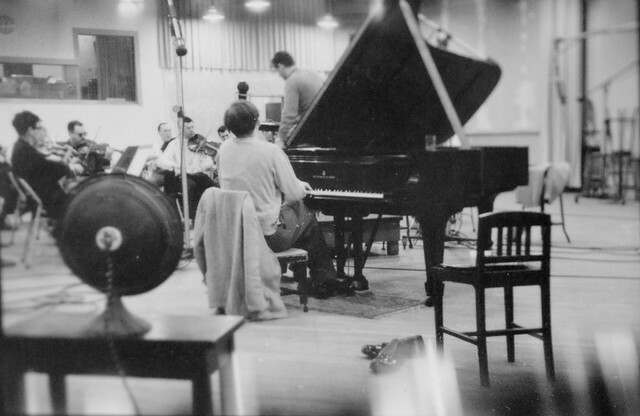 I have been fascinated by this studio since falling in love with Kind of Blue years ago. I walk by the former location and think about it whenever I'm in the neighborhood. chilinvilin and 2xUeL like this. July, Dan? In the video there are a fair number of people outside bundled up, and it hardly seems likely that there would be need for any additional heat in New York at that time of year. I'd guess based on the outside shots sometime in spring. As for whether that's the same session or not...I don't know. My guess is it's from the same general era, but I'm thinking perhaps at sessions for another album. Wow, you really have a good eye! 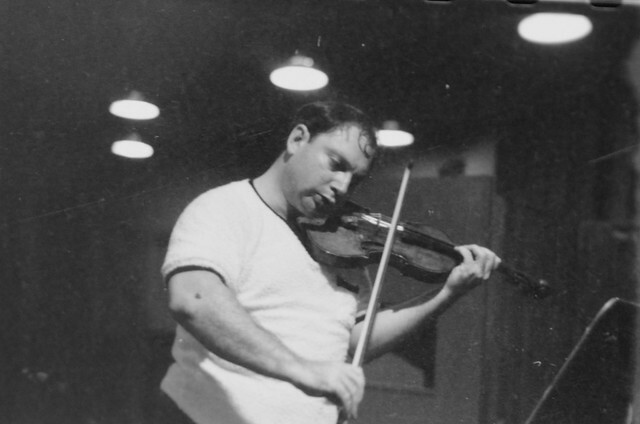 There are later pictures in that series showing Bernstein with Isaac Stern, so I believe you are right. And thanks for the correction about Robert Coote. The caption that I saw called out Stanley Holloway, but I didn't think it looked like pictures of him that I've seen, and I don't know Robert Coote. You've seen the video more recently than I, but I thought I remembered subtle fun being made of Gould for being so bundled up, and I have a mental picture of the cab driver in the opening sequence being in shirt sleeves with the window open that Gould wanted closed. I'll stand provisionally corrected on the month. 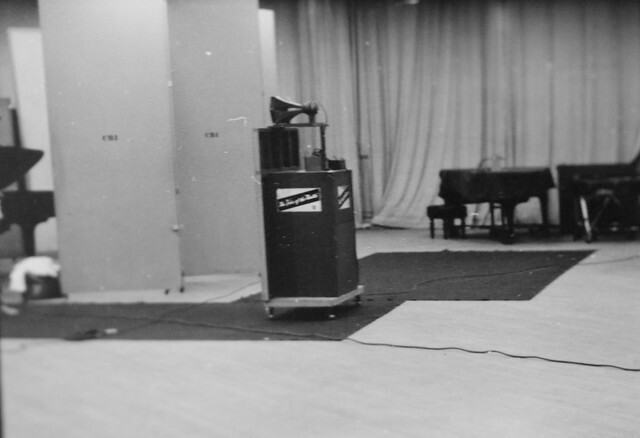 Still, that picture could have been some other time, but how many times was he in the 30th St. studio over the years? A. Is there any kind of complete list of who recorded and when in the studio? B. 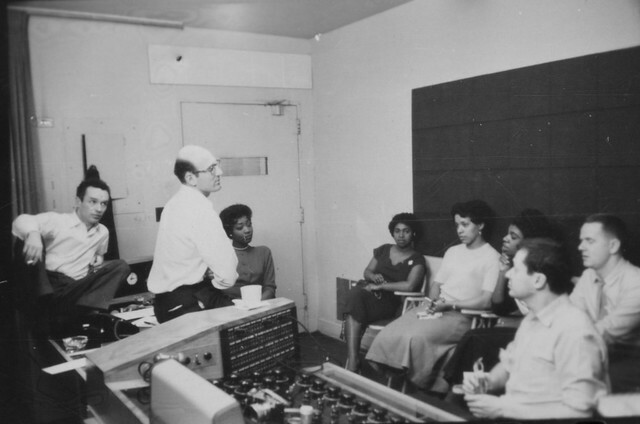 When Frank Laico retired, his colleagues gave him a studio book that had all kinds of session information: what EQ, volume, compression, reverb settings were "the" settings for a particular performer; other session information that would be the bible for how to treat that particular artist or group of artists; and I don't know what else. They gave this irreplaceable information to him as a signal of their vast appreciation and affection for him. Somehow, some way, some time, that book got lost or loaned out or taken or thrown out inadvertently or damaged or whatever. He didn't have it when he came to Seattle and wished he did. If anyone should find or have it, it would be a valuable service to aficionados to make it public. chilinvilin, bluemooze and MLutthans like this. Drapes definitely in view, FWIW. chilinvilin, 2xUeL, DMortensen and 2 others like this. Yes, I'm not at all arguing that there were no drapes after a point, because they definitely were present, but there were many more earlier and they were always spread out for maximum absorption. 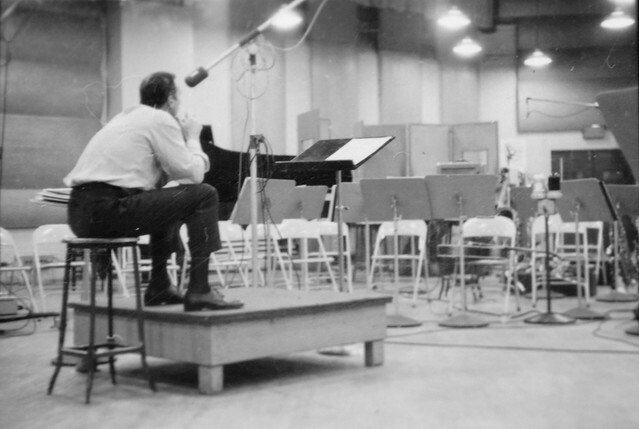 My understanding from listening to people (who will go unnamed because I can't quite remember who they were) was that in the very early days the studio recordings were problematic, but then they figured something out and everything was groovy. 2. WLIB left everything in place when they left and someone at CRI made the decision to tear all that crap out and see what it sounds like, because it couldn't sound any worse (or because a concert hall doesn't have all that crap, let's go with the natural reverb from the mostly hard walls). They did it, it sounded fine, and Mitch said leave it alone don't touch it. 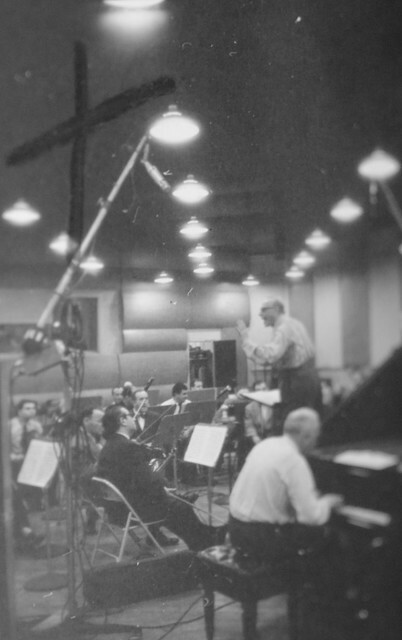 I'll show some pictures of other early recording sessions tomorrow since we are on this subject. chilinvilin and bluemooze like this. Great thread thanks for all the great information and pictures. chilinvilin and MLutthans like this. This is a brilliant read, even for someone not too well aquainted with the music. Thankyou. Can I assume some if not all the classic Laura Nyro stuff was done there ('New York Tendaberry' in particular, has a massive intimate but spacial sound)? Sitting in the UK a long way from NYC this is going to be a very enjoyable and informative post. Thank you for all the time and dedication it's going to take to post on a subject which you are clearly passionate about. 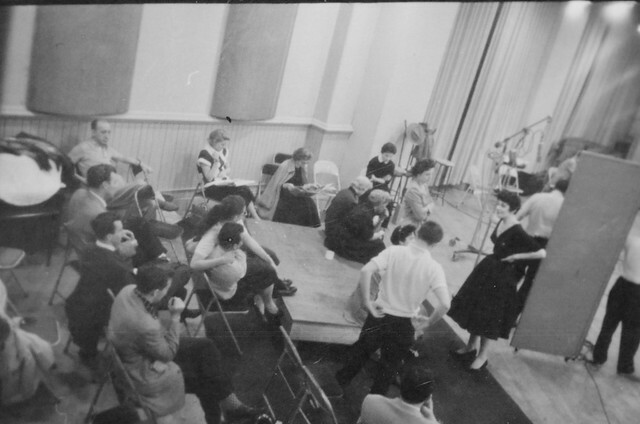 As promised, here are five more pictures of sessions, all from MSS 52, The Frederick and Rose Plaut Papers in the Irving S. Gilmore Music Library of Yale University. Here are a few more of the session in which we saw the wall treatment. 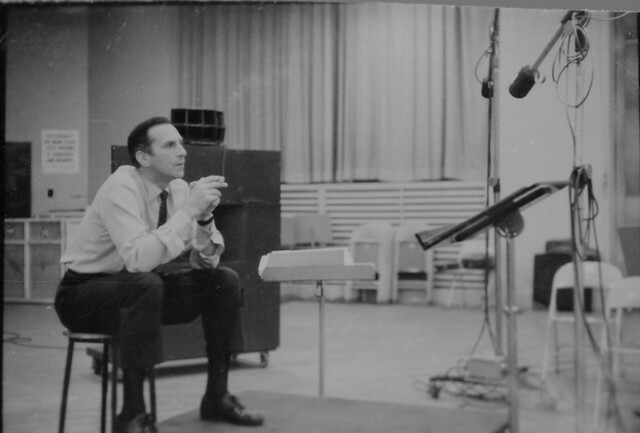 This is in the control room, and since that's Howard Scott standing there, you would think it was an Original Cast Recording of a Broadway show or an opera of some sort. There was no information about who any of the other people are. 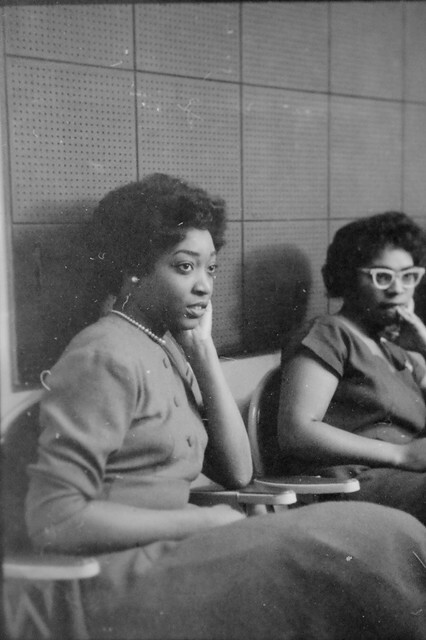 This series is notable because there are very few pictures of black women in the studio. 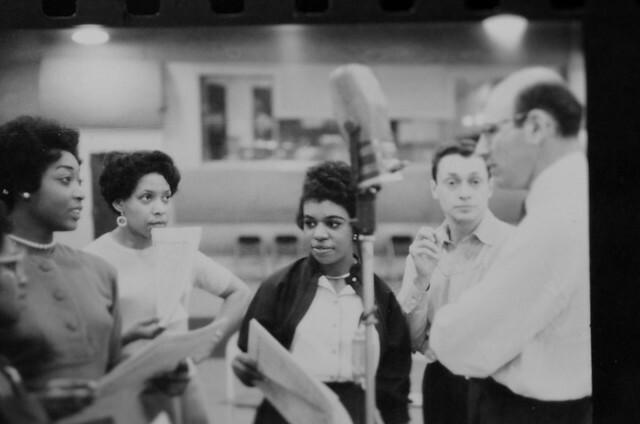 There's lots of black men, as John Hammond, Goddard Lieberson and others made a point of ignoring color when it came to talent and ability, but I am not aware of many more pictures of black women here. I'm including more in case any of you can identify anyone or the show. If you are interested in the subject of integration of recording, John Hammond's autobiography or a biography of him would be a good place to start. 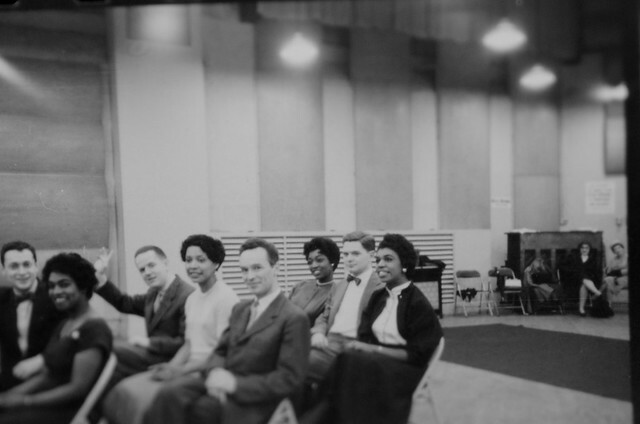 who became president of Columbia Records either just before or sometime after these pictures and those above were taken. He was apparently a lanky son of a gun, and there are many pictures of him in a pose similar to this, almost always with a cigarette in hand. Unsurprisingly IMO, he died of cancer in 1977 at age 66. 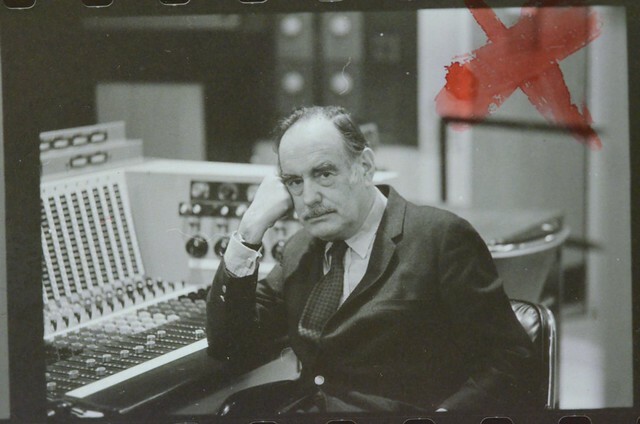 Frank Laico and his wife always talked about what a nice man Goddard was, and from the quantity of pictures of him in the studio he really loved being part of (and undoubtedly driving) that process. I don't think you can overestimate his importance to Columbia's success during that period, or to the level of quality at which it presented its product and took care of its performers. From all reports that I've seen he really cared. Also, he and I attended the same university, which I didn't know until posting that Wikipedia link. And I'm a lanky (albeit thicker) S.O.B. too! Back in a few minutes with more pictures. chilinvilin, jfeldt, wave and 3 others like this. 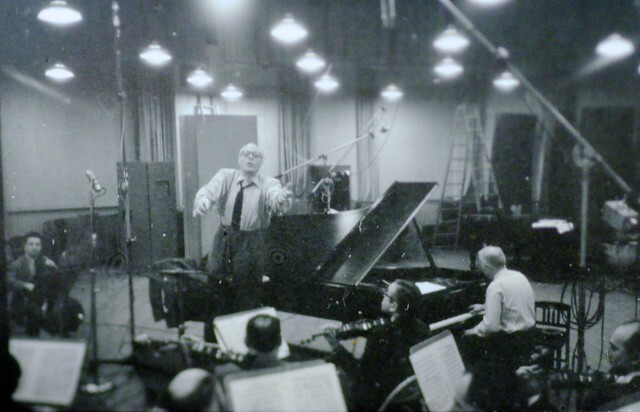 Here are some pictures of George Szell conducting an orchestra (I don't know what orchestra), with Robert Casadesus the French composer and pianist. You can look both of them up on Wikipedia if you are interested in learning more. There are nice descriptions with multiple pictures of each of them. Note the curved portable baffles lined up along the walls in most of the shots. That makes me think that pictures with these baffles present were at the beginning of the period under discussion, as they are not at all present in pictures from later eras. Those things are so big that you would think they would stay in the room until they fell apart. And maybe they did, or the curved shape created acoustical problems as convex shapes usually will. Even though the quality of that little sequence got worse as it progressed, I kind of liked it because it showed different parts of the studio in the backgrounds. In the picture above, the control room window runs out of the frame to the left. Notice the floor-mounted studio monitor in the background. We'll jump to a new post and talk about that, as well as clean up a few loose ends for today. Johnny Todd, Fastnbulbous, chilinvilin and 5 others like this. This a MOST amazing series of posts. I just stumbled acros it look forward to reading through it completely. Thank you. Hey, the darn thing is just an Altec Voice of the Theater with a fake front and the horn raised up to head-height or so! I don't know enough about those speakers, of which there were various iterations over the years, to say which one it is. But there you go. I don't know who that is on the left, but he looks bemused. I love it that this astonishing, towering musical talent who had such a huge impact on music during his lifetime is performing in his t-shirt! And that brings up a subject that I hope we get to at some point: the heating and cooling (or lack of) in this huge space. But not today. The improving of the pictures' exposure/contrast also came up in the thread, and while I'm happy to have comments about how to do it better and thrilled to see it actually done, by way of explanation of why it isn't better: I took 960 pictures in a little over three hours, which works out to around 300 picture per hour, which is about 5 per minute (ignoring a bathroom break and a few minutes rubbing eyes and stretching, as well as finding the relevant photos amongst the 35000 or whatever in the collection, so the per minute rate was many more most of the time). All pictures were taken hand held because tripods are not allowed in the archives. We have to use the random room light, as lights and other apparatus (like something to hold the contact sheets) are not allowed. All of the pictures you've seen have been somewhat color-corrected to look OK on my monitor, so you are having to put up with my judgement about when to stop editing and move on to the next one. There are a bunch more that I haven't edited at all, and all of the above is FYI. I also considered before posting that they are ****ty quality pictures as a group, but decided that seeing the information in them outweighs the very low signal to noise ratio. I know that everyone here agrees with that feeling (while simultaneously wishing they were better quality, as I do) so there's no need to discuss it. But since I'm the one putting them out there I wanted to explain some of the process and limitations and do hope this isn't perceived as complaining about comments and suggestions. I just want to explain why they aren't better. 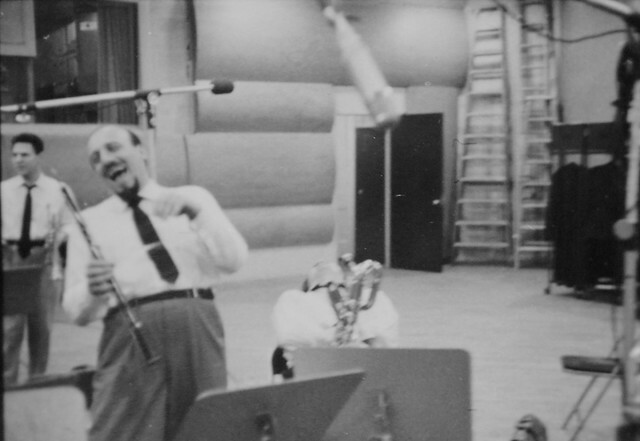 That is Mitch Miller and a couple of people from what is identified in the archives index as the "Columbia Jazz Ensemble". Wow! The picture from 1940 at the top of his bio looks like a completely different guy! Regardless, he was an incredible character, and the blurry pic ITT above really captures his zest and exuberance. The baritone sax player to his left has thrown his head back to what looks like a painful position in laughter. If there were a Wikipedia category of "Larger Than Life" people, I don't doubt he would be in it. He was a big influence in many spheres. As before, these pictures are all from MSS 52, The Frederick and Rose Plaut Papers in the Irving S. Gilmore Music Library of Yale University. Oh, and this will be my last large post for a bit; the next week will be kind of hectic, but I'll pop in periodically in case there are questions I can answer quickly or make short comments. I'll look forward to getting back to our explorations. It has been really fun presenting this to you, hearing such uniformly nice responses, and learning more from so many knowledgeable people here. chilinvilin, jfeldt, Mister Charlie and 3 others like this. Dan, I'm pretty sure those Columbia monitors are Altec A5x models [EDIT: see correction two posts down]. 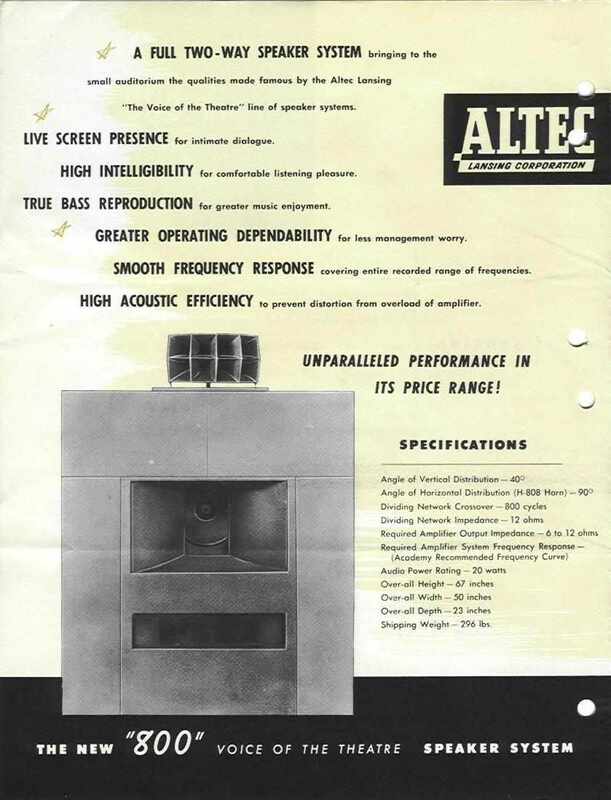 The larger Altec speakers (A4, A2, A1) are often found "with wings," those outward flanges that stick out to either side, to reduce low-frequency cancellation by sounds coming out of the back of the cabinet. I have never seen A5 speakers that came with wings from the factory, but I would not completely rule it out. However, I think it's more likely that it was a CBS home-brew alteration. chilinvilin, 2xUeL, MMM and 1 other person like this. Now I get a chance to offer a correction for your consideration! Those flanges are realistically not going to do much to affect low frequency sounds from the speaker back. Low sound waves are multiple feet long and IMO would go around that size baffle without noticing it was there. My interpretation of why the baffle is there is to extend the mouth of the horn a bit by giving a larger surface to project from rather than smaller. When you mount loudspeakers adjacent to or within a larger plane the low frequency extension increases as opposed to a smaller or no plane. Simply placing a loudspeaker cabinet next to a wall so that the front of it is flush to the wall on the side will do the trick, too. So, for example, if the square of my avatar on the left was made up of solid walls (looking at it in plan view- that's from above, right?) and you put a speaker (pointing at a listener at the bottom of this page) at the bottom right corner (about where the avatar guy could reach out and touch it with his right hand), then the frequency response would be improved as opposed to being in free space. Better would be mounting it about where the guy's left side is, so that it is within the wall pointing downward to our listener below. That phenomenon is called loading; putting a speaker on the floor as opposed to up in the air gives you half-space loading. Moving it along the floor until it is next to a vertical wall (pointing any direction, I believe) gives you half-space loading. Moving it into a corner with another vertical wall gives you quarter-space loading, all of which reduce the space that the speaker is putting the same amount of energy into and thereby increasing its efficiency. The effect is most noticeable for low frequencies since they are basically omni-directional. You can also achieve a similar effect by massing speakers in the right way, or by making the mouth and depth of the horn longer and wider and taller in the right way. This front baffle thing gives you better-than-free-space loading while being a manageable size. And it may very well reduce mid frequency BS coming from the back of the speaker to a listener placed directly in front of it. If the speaker has its back near a reflective wall, though, that stuff will be scattered through the space. My comments also presume that that speaker is generating truly low frequency sound, which may be debatable. It should be said, too, that speaker box bracing in those days was not as good as it is today, so I don't doubt there is garbage coming from the back. Speaker and driver design, for that matter, weren't as good then, either, by and large. chilinvilin, 2xUeL, jfeldt and 1 other person like this. This is a great thread and very informative. Gould: That was a very good week, I must say. Easier than most. Scott: I don't know why. Now when do we come back? Gould: About three weeks, I think. As far as the weather goes, some people are in short sleeves, but others have jackets on. So my guess would be spring sometime. That said, in Off The Record, there are plenty of leaves on the trees at his cottage. So I'm not certain. 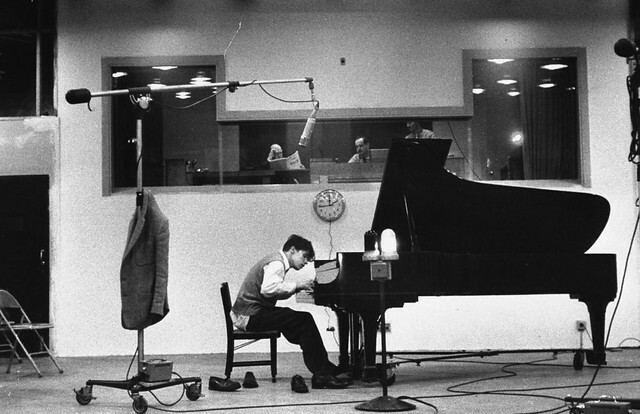 All of that said, Gould was auditioning pianos at Steinway and decides on one, so it doesn't make much sense that he would have had multiple pianos to choose from at Columbia, per that photo. bluemooze and crispi like this.